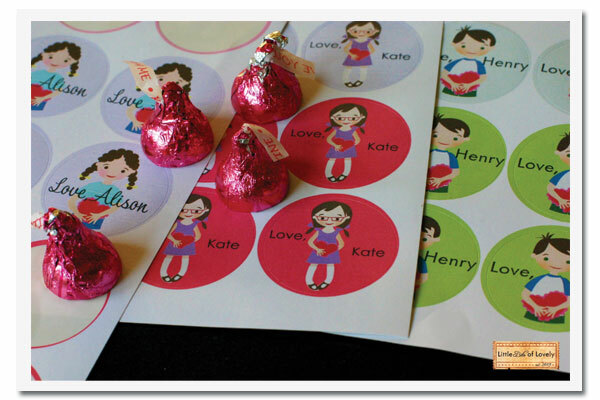 Last night the kids and I put together their treat bags for their Valentine’s Day exchange, and in an effort to save time, I whipped up these personalized stickers based on my Little Pals bookplates. I especially love how Kate’s turned out. The lavender dress, the turned in feet, the glasses! Oh, it’s too perfect! So the kids stuffed their treat bags, and then slapped one of these stickers on. Easy peasy. And in case you were wondering. Yes, we ate the left over candy. All very cute! Surely you can sell these next year. Send a pic of your kid and I’ll turn it into a stick. Happy valentines to you all. I wish I could just “whip up” such adorable things for my girlies. LOVE THEM!!!!! The one of Kate is totally cute with her glasses on. You are so talented…and I just love your vintage look! so cute! and i’m jealous that you are able to do these. i want to learn how!! !